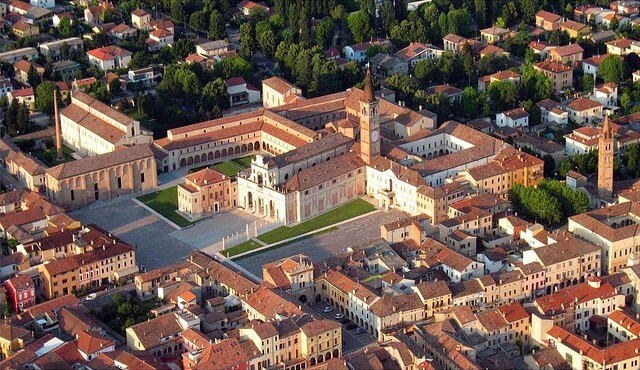 San Benedetto Po, located in the northern Italian province of Mantova, owes its reputation as an outstanding example of artistic, architectural and religious importance to the namesake abbey complex founded in the 11th century. The main buildings were designed in the 16th century by Giulio Romano, who, apart from his architecture also exemplified by the Palazzo Te in Mantova, is the only Renaissance artist mentioned in Shakespeare’s work. The small town is also remarkable for its efforts to preserve regional cultural and craft traditions displayed in the Polironiani Museum within the abbey. During the last decade, the abbey underwent an extensive and costly restoration that returned this masterpiece to its former splendour, following a programme based on the best scientific and art-historical standards. The work had been largely completed when the earthquakes of 20 and 29 May 2012 struck, severely damaging the abbey and setting back the restoration already accomplished. Consequently, large parts of the abbey have become inaccessible due to the risks of falling debris or collapse. In response to the nomination by Italia Nostra, this site was shortlisted for ‘The 7 Most Endangered’ in recognition of the existential threat caused by a natural disaster and of its uniqueness in Europe’s cultural heritage.